SAAB photo. Saab 9-5 Sport Combi II go. Jürg was traveling with his family for vacation to Denmark. Of course in his Saab 9-5 Sport Combi, when there was an unexpected meeting of different generations Saab. 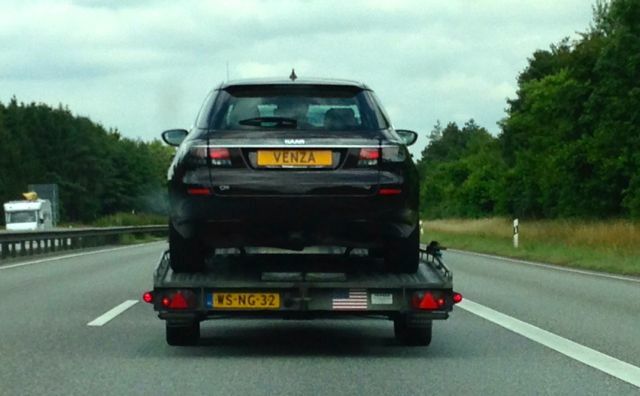 Was a rare Saab 9-5 Sport Combi II – on a transporter – also traveling through Germany. Logical that ranpirscht be there, abpasst the right moment, and then shoots the images. Thank Jürg! 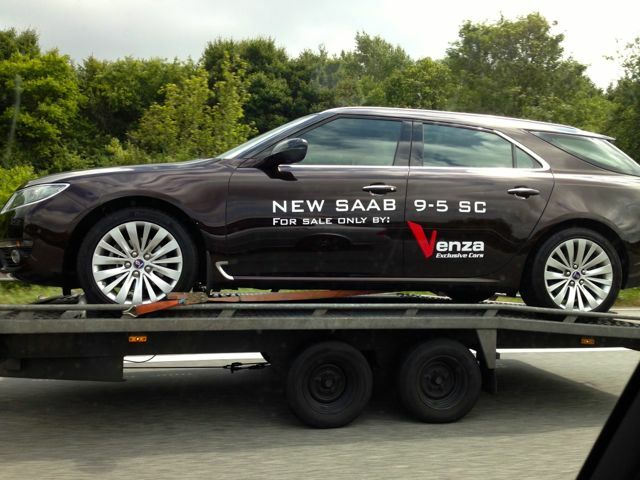 In the Netherlands at Venza still some pre-production sports estate for sale, to a considerable number of Saab 9-4x. Not all vehicles are listed on the internet. Friends who have stopped by there to report that the stock is larger than it shows the homepage. Where the 9-5 Sport Combi II was traveling, could not long remain secret … Saab’s world is so small! A longtime fan of Saab residing in Germany had given the rare Saab. He wants his name mentioned here do not see what we can comprehend. An exclusive fun, congratulations on your blog! We can therefore welcome the fourth sport wagon on our roads, which would correspond to about 10% of total production. For fans who deal with the issue, now know that there have been more than 27 pieces and assumed that the number of pieces will have lain somewhere between 40 and 50 copies. Many were scrapped at Some of the whereabouts are still not sure, and Saab 2.0 NEVS owner should have a handful on the premises. So all we will probably never be able to clarify. Always come back, even a long time after the end of production, new vehicles on the market. Switzerland has for some weeks a Saab 9-4x, which is now traveling with Swiss registration in the Alps. And the 9-5 Sport Combi II the German Saab fans? He also has his license and is in the Republic of the road. Last week he was seen where a stronghold for all Saab collector vehicles is more recent. In Kiel, the local Saab Service and unofficial 9-5 II competence center, then there were three mega-rare sports estate on the Firmenhof.Again! ← Nr. 20 stored in a warehouse somewhere in Latvia. The sc blind spot warning system.